The wine business is not so easy anymore! I think you would agree that we are at a complex industry stage and that it is a lot harder for winery owners who want to build profitable businesses, to eventually SELL AND RETIRE. I think you would agree that we are at a complex industry stage and that it is a lot harder for winery owners who want to build profitable businesses, to eventually SELL AND RETIRE. (5) Cost of doing business is higher. The wine business is not so easy anymore! 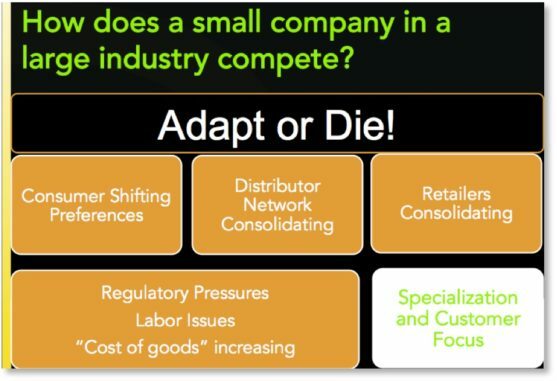 The only choice for small producers is to specialize and to command a higher price through a much more differentiated/distinctive customer experience and product. What I would say is if you want to be around in 10 years, you need to figure this out and do it profitably. For some this is daunting; for others, an exciting proposition or challenge to meet. As you kick off your annual planning process, here are six ways to be more proactive in addressing gaps in your business; up your game and likely improve winery cash flow in 2018. Facilitate a management team summer offsite, focused on 2018 operational planning: engage your managers in goal alignment and tactics development (with a touch of strategic). Energize your team through a 360-degree assessment: understand strengths and gaps, and implement development steps. Run profitability scenarios before making decisions: develop realistic underlying assumptions and understand all options for changes in product pricing, committing to unplanned capital expenditures, hiring new staff, launching new products or brands. Here is a link to Scion Advisors’ offer. Lean on outside experience: consider investing in active coaching. A good coach can help you build more confidence and competence in key areas such as: understanding the profitability of each product; designing more effective financial and sales reporting, managing organizational changes, driving product pricing decisions. Here is a link to Scion Advisors’ offer. Get educated: sign up for seminars at Linfield College, UC Davis, and Sonoma State – there are many more resources these days that teach vintners how make better financial decisions. Additionally, here is an interesting presentation on How to nurture a health wine business – given at this year’s Oregon Wine Symposium and at an August seminar for the Walla Walla Community College. Here is a link to those presentations. Find out how we can partner with your team to improve your operational strength and build roadmaps for future growth. Call Deborah Steinthal, to set up a meeting (707-246.6830). * less than 700 distributors represent over 9,000 wineries or 100k+ skus nationally, versus 3,000 in 1995, representing 2,600 brands.